Week Eight of the 2018 high school football season provided yet another test for the Lakeridge football team. But for the fourth week in a row and the sixth time this season, the Pacers passed that test with flying colors. No. 11 Lakeridge won its fourth straight game on Friday, knocking off No. 19 Bend 35-23 at Lakeridge High School and sending the Pacers into their season finale with a ton of momentum. 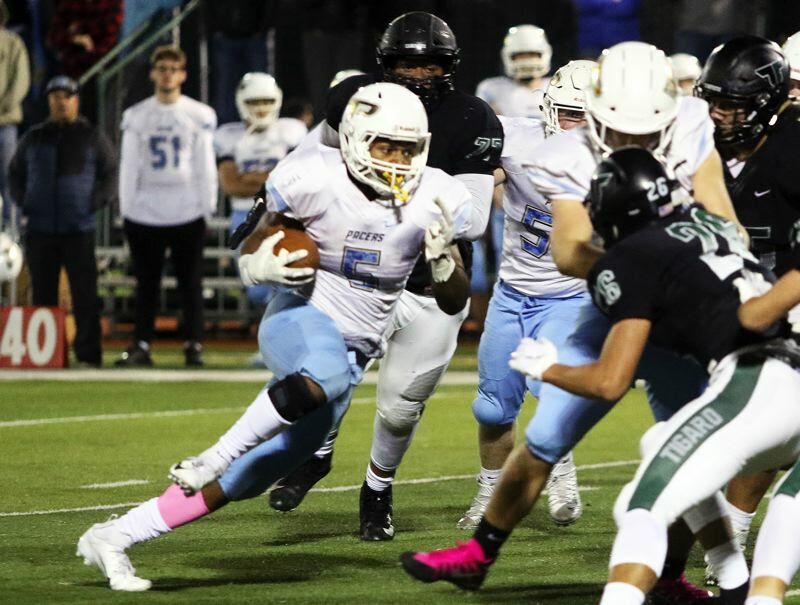 Lakeridge ends the regular season with the annual Battle of the Lake, facing top-ranked Lake Oswego at Lake Oswego High School at 7 p.m. Friday. The Lakers enter the contest as the state's top-ranked team, winners of four straight games, leaders of the Three Rivers League and carrying a 4-0 TRL record and a 7-1 overall mark. The Pacers come into the contest as the state's No. 11 team, winners of four straight games, tied for second in league, and carrying a 3-1 TRL record and a 6-2 overall mark. "We feel great. Our kids have been getting better every single week, we're prepared and we're healthy for LO," said Lakeridge coach Elvis Akpla. "We're really, really, focused." In the win over Bend, the Pacers started quickly, grabbing a 7-0 lead in the first quarter thanks to a 23-yard touchdown pass from senior quarterback Charlie Maynes to senior tight Nick Musgrove. The Lava Bears came back to tie the score on a short run in the second quarter, but Lakeridge responded at light speed — junior Bryson Corbin ripped off a 98-yard kickoff return just seconds after Bend's score to give the Pacers a 14-7 edge at halftime. Then, after a scoreless third period, the game took off in the fourth. After combining for just 21 points through three quarters, Lakeridge and Bend teamed up for 37 more in the game's final 12 minutes. The Pacers took the upper hand early in the fourth, getting two rushing touchdowns from junior Jalen John to push ahead 28-7. John's first score came from 2 yards and then, following a stop by the Lakeridge "D," John broke free for a 77-yard scoring run. Bend, however, came back strong, responding with 16 straight points to close within 28-23. The Lava Bears' streak began with a safety, then continued with back-to-back touchdown passes by senior quarterback Cooper Simmonds, the first a 25-yarder and the second from 20 yards. Undaunted, the Pacers went back to their powerful ground game, sealing their victory with a 6-yard John touchdown run. Senior kicker Maxwell Chandler capped the night with his fifth straight extra point for the final 35-23 margin. "For our kids, it was really difficult to stay focused on our Senior Night," Akpla said, noting his team's 25 seniors. "It was a really emotional night for that reason." For the game, Maynes went 12 of 17 passing for 171 yards with one touchdown and two interceptions, John carried 15 times for 155 yards and three scores, and senior wide receiver Will Scadden made six catches for 104 yards. The loss was Bend's second straight and dropped the Lava Bears' overall record to 5-3. Bend closes its regular season with a 7 p.m. Friday home game against Mountain View.